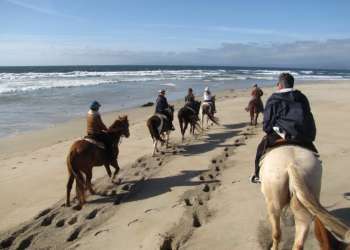 A romantic trip to Monterey County features Nature at its naked best. It&apos;s a potent cocktail: 99 miles of stunning Pacific surf, enchanting forests, sprawling vineyards and a bevy of blissful inns ideally suited to seduction. From roaming with wild things to romping in the redwoods, the options are endless. Add in the annual migration of whales, birds and butterflies, solitary beaches and cinematic sites and it&apos;s easy to see why Monterey County&apos;s romantic roots run deep. Get up close and personal with all things wild aboard Elkhorn Slough Safari&apos;s 27-foot pontoon boat. The 1,400-acre Elkhorn Slough Reserve is ripe for romantics seeking a truly natural experience, with some 400 plant species, 340 types of birds (including the Peregrine Falcon and Snowy Plover), otters, sea lions and 80 kinds of fish. Side trip: At the Captain&apos;s Inn in Moss Landing, cozy up in a room with a roaring fire and deep soaking tub for two that overlooks the vibrant line-up of wildlife. For dinner, slip over to Phil&apos;s Fish Market for a steaming bowl of aphrodisiac-rich mussels or award-winning cioppino. Get in rhythm with a tandem kayak tour at Lover&apos;s Point. This romantic cove is the ideal launch for Adventures by the Sea&apos;s two-hour guided tour into the world of frolicking otters, harbor seals, sea lions and migratory fowl. Inland, rows of romantic Victorians line Pacific Grove&apos;s streets while lovers stroll the Point awaiting sunset. Side trip: Continue north on Ocean View Drive, just past Asilomar State Beach, and head for Pebble Beach&apos;s stunning Inn at Spanish Bay. Pop in for alfresco cocktails around the fire pits. As the sun sizzles into the sea, a resident bagpiper transcends time with a hearty march across the golf greens. If a poet&apos;s love den pumps up the veins, hightail it to Carmel for a tour of Robinson Jeffers&apos; Tor House and Hawk Tower. The romantic stone cottage and tower nestled surfside between multimillion-dollar mansions is a tour de force in both love and craftsmanship. Shimmy up its cylindrical staircase to a 40-foot perch with breathtaking views of the rugged coastline that inspired Jeffers&apos; 400+ blank-verse poems. Inside, stone fireplaces and a classic Steinway grand piano once played by Gershwin and Chaplin take center stage. 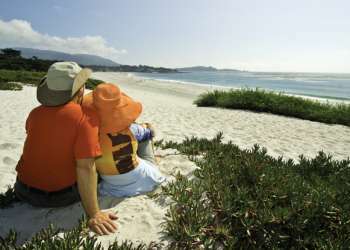 Side trip: Surprise your lover by watching the sun set in style at Carmel Beach. Bring a bottle of wine and some snacks to fully enjoy nature&apos;s daily spectacle. Big Sur is no novice when it comes to love, lust or spiritual renewal. This magical swath of land just 30 miles south of Carmel has transformational powers as evidenced the wealth of writers, New Age leaders and native souls who all called it home. Perhaps that&apos;s why Yahoo Travel continues to rank it one of the country&apos;s top romantic destinations. Tapping into the Esselen and Salinan Indians, Big Sur Guides offers a love-inspiring "Walk of the Married Redwoods" hike culminating at the apex of one of the largest waterfalls on the coast. The DIY version, which is equally as stunning, includes a trek to the Julia Pfeiffer Burns State Park&apos;s McWay Falls via the Headlands Trail. Side trip: Book a massage at Ventana Inn & Spa and heat things up with a dip in the clothing-optional pool and Japanese-style soaking tubs, followed by a luscious locally-produced Pinot Noir. Rent out Holman Ranch for a getaway in grand style! This Carmel Valley country estate (1928) saddles up with nearly 400 acres of prime turf, a state-of-the-art equestrian facility full of steeds and plenty of space to horse around. The eight-room retreat delivers the ultimate in privacy with sprawling vineyards and olive groves for long walks, sunset horseback rides and catered meals certain to set the mood. Side trip: Sinful and seductive, a repast at nearby Lucia at Bernardus is a sure bet for powering up the passion. Chef Cal Stamanov raises the bar for fine dining with award-winning cuisine crafted from locally-sourced products, including those straight from his own on-site garden. Sail away to a lovefest at sea. As the sun sets over Monterey Bay, drift away with and Monterey Bay Boat Charters on a private dinner cruise featuring the catch of the day, a cache of local wines and iconic backdrops including Cannery Row, Pacific Grove and the stunning Pacific coastline. With the seasonal migrations of whales, birds and butterflies in full swing, Monterey Bay National Marine Sanctuary and its environs are a haven for couples seeking serenity at sea and a bit of action. Side trip: Continue to make waves with an overnight stay at the romantic and oceanfront Spindrift Inn on Cannery Row. Unleash that inner animal with a walk on the wild side at Monterey Zoo, an exotic B&B adjacent to Wild Things Animal Refuge. The refuge holds 100+ critters on 50 acres of Monterey County&apos;s Sun Belt. Couples can book a full day of play in which they can wash an African elephant, monkey around with Forest the monkey or stroll with a big exotic cat. In February the evening Mating Tour is a real roar. Side trip: Go for the ultimate in wild nights with an overnight stay in one of the authentic safari tents. Clock out to the sounds of roaring lions and trumpeting elephants against the sweeping savanna; in the morning, wake up to a continental breakfast delivered by an elephant. Nature lovers can tap into nirvana at Marina Dunes Natural Preserve. This sprawling 170-acre expanse of protected dunes and the adjacent Marina State Beach deliver a surreal lunar seascape punctuated with surfers and seabirds. Pack a picnic and watch as the sun shifts into romance mode. Side trip: Enjoy a romantic beach bonfire Sanctuary Beach Resort. At night the roaring sea, resident seagulls and whispering winds provide a perfect backdrop for Cupid&apos;s arrow.